Wheat grass juice can be one of the best "super foods" for cleaning lymphatic fluid. So, if you suffer from lymphatic congestion associated with conditions such as throat inflammation or swollen lymph nodes, everyday use of this extraordinary juice can be a solution for you! The most common wheat grass is cultivated with mineral nutrients, in water, without soil - it is easy to grow at home and we would even say it is extremely simple. Wheat is sown with a little earth in a bowl, we put a thin layer of grain, which before this process is deposited on wet paper so wheat germs can appear. The grass is regularly watered and the most appropriate time for harvesting is about 9-10 days after sowing. So it is harvested in its early stages of growth in order to obtain the highest quality contents. After sowing and harvesting, now it is time to make wheat grass juice. Wheat grass, which is strained in a quality juicer, provides a wealth of nutrients (including chlorophyll, a full range of proteins, and many vitamins, among others Vitamin A and C). In the developed market of Western Europe and North America, it is possible to procure juicers just for this purpose. Especially popular is manual juicer for wheat grass but do not despair if you cannot obtain it at the moment, in order to make a drink, your current juicer-blender, which you have in your household, will serve its purpose. 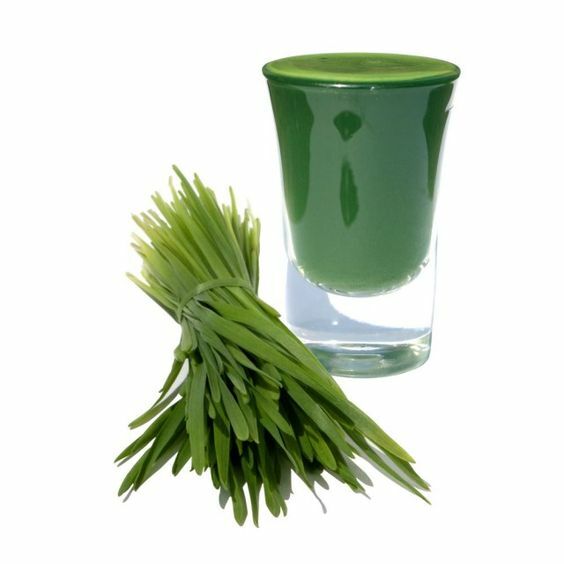 Infections of the mouth and throat or purulent angina-you can try to calm down and cure throat inflammation by gargling wheat grass juice. Swelling of the lymph nodes (which can be found on the neck, pegs and armpits) due to the accumulation of bacteria in the lymph nodes. Do not give up because of the color or its name: wheat grass has a pretty pleasant taste, which resembles the taste of sweet peas! If you are new to preparing wheat grass juice, you can choose a very interesting taste mixed with some freshly squeezed juice: orange or banana, while in time - when you get used to the pure taste of wheat grass, you can drink pure juice made from green wheat grass. So, in order for your body to fight against infections (e.g. throat inflammation), try the wheat grass in small sips! It could be the perfect natural remedy for optimum general well-being. Wheat grass in powder can now be easily purchased in virtually all health food stores. Put the grass in the juicer, then put the pre-peeled bananas in the blender and add apples and water as well as the previously obtained juice from the wheat grass. When the mixture is well mixed and seated, cover it in the appropriate container. If necessary, keep it in the refrigerator. Also read the text dieting against cancer.